People of a Feather will be at Empire Theatres at the Avalon Mall for one extra screening on January 17th, at 7 p.m. Don't miss this doc! Friends, there’s one other thing you should do before this storm hits: go see People of a Feather. It’s incredible. And it’s only playing at the mall until tomorrow night. Inspired by films like Baraka and Atanarjuat: The Fast Runner, People of a Feather says more with images and sound than it does with words. 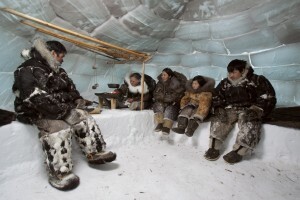 It’s a documentary about the Inuit of the Belcher Islands, near James Bay, and their relationship with the eider duck. Save for narration here and there, there aren’t any formal interviews or talking heads in the film; if there are voices at all, they arise through conversation and action. But mostly, you’re pulled through a compelling narrative by time-lapse images of the Arctic. It’s an impressive accomplishment. Eider ducks live up in Hudson Bay all year round. They mostly hang out in big gashes in the sea ice, diving down to the bottom of the ocean to grab sea urchins, which they eat. Whole. In one swallow. Shown through (strictly non-cheesy) re-enactments, the Inuit of 100 years ago used the ducks for food and clothes -- they made soft, warm jackets from the feathers to keep them warm when they hunted seal. Today, they still eat the ducks and use their down to stuff jackets. But today, the ducks aren't as healthy or as plentiful. That’s mostly because of hydroelectric power -- specifically, a series of hydroelectric dams belonging to Quebec near the James Bay watershed. In the winter, when people in Quebec are cranking up the heat and requiring more power, the dams open up and warm fresh water gushes out, seeping out onto the sea ice. That water freezes quickly, and it freezes over the big gaps in the sea ice. The ducks wind up piling into tiny cracks, and having to dive farther and farther out to find urchins. In one gut-wrenching underwater scene, we see a duck desperately trying to poke its head back up through ice to get some air. Exhausted, it finally dies. The director, Joel Heath, is now working with the Arctic Eider Society to encourage the decision-makers behind Muskrat Falls to look at incorporating hydrogen fuel technology into the project. Iceland, for example, captures power at hydroelectric dams and converts it to hydrogen fuel, stored in cells. Those cells then fuel Iceland’s cargo ships. Heath is originally from St. John’s, and he was up there doing research for his PhD on the eider ducks and the sea ice. A long-time photographer, he built a special underwater camera to take footage of the ducks diving for urchin, which the BBC wound up using. He’s been working on the doc for almost ten years and it’s paid off: it screened at HotDocs, and has won major awards for direction and cinematography. With Idle No More happening, it’s really crazy seeing underneath the layers of people’s perspectives on First Nations. So, I think it’s really important to show, as the film shows, that their culture being alive and that they have an economy and they’re living off the land, and the resources around them are really important. To show that they’re not all just drunks and staying home, they’re out there bringing back food to the community, and it’s local free-range organic food. They’re living sustainably, and we have a lot to learn about being local and sustainable from these communities, and actually having an economy that’s linked to our local resources. And their innovation, they’re such amazing craftsmen. In the film, you see them making harpoon heads, making rope out of seal -- their skills are so amazing, and they’re still alive and well. I imagine you’re pretty close with a lot of the Inuit people in your film after working with them for so long. How do they feel about Idle No More? From my perspective, it seems like it could be revolutionary, and really bring about a lot of change. Do they feel that way? I think so. There has been some good coverage, they’re really getting the word out, but the amazing thing has been all the ignorant and racist comments coming back on everything. But that shows how people in Canada just really don’t have any idea about what’s going on. So that’s why I think it’s really important to get a film like this out there, and show the other side, because people only see the bad news. Here's a link to an article in The Telegram with more information and here is the Facebook event page for the St. John's screenings.